Today, August 24, is National Waffle Day! Waffle on! Not that I ever need a special reason to enjoy waffles, two waffle posts in a row might be a clue to that enthusiasm. Here is my latest waffle recipe, a Savory Southwest Sourdough Waffle. This US holiday marks the day the first US patent for a waffle iron was issued. Instructions for waffles using irons exist from around the 14th century. General Electric offered the first electric waffle iron in 1911. Eggo frozen waffles were first sold in supermarkets in 1953. Belgian waffles made their US debut in 1964 at the New York World's Fair. We shared the first waffle hot off the iron. RL opted for butter and a drizzle of honey on his half, while I separated top from bottom and slathered my wedges with whipped honey butter. Mmmmmmm, bliss! Don't bother to make a half batch, you will want some to enjoy warm or cold another time. 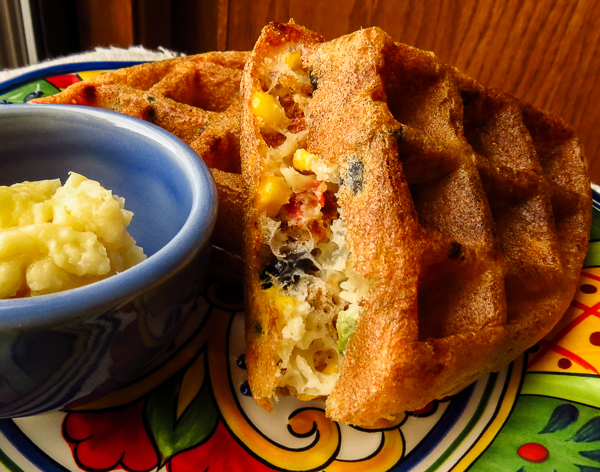 Warmed leftover waffles pair well with a bowl of your favorite chili or bean soup. 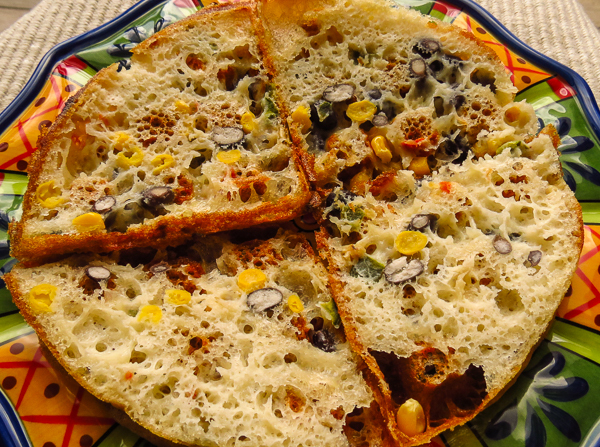 Or enjoy them cold as sandwiches filled with cheese, salsa, avocado, corn salad, taco filling of any kind, etc. 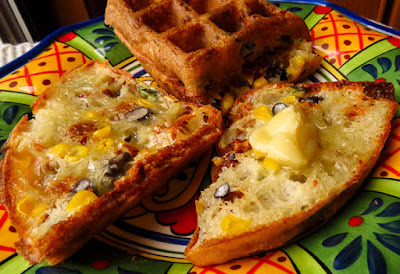 Leftover waffles freeze well and reheat easily in the oven or in a toaster (split in half if you make Belgian waffles). Homemade waffles have more flavor than Eggos and can be just as easy to reheat when you are in a hurry. 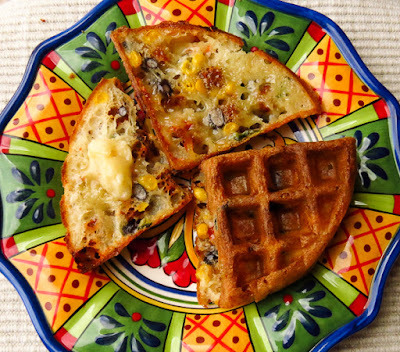 Waffles are more versatile than just a breakfast food. They make any meal, any day, a celebration. What's your favorite waffle? Put the starter in mixing bowl; add sugar, egg and oil. Mix well with wood spoon. Thin with water as needed (starters vary in consistency). Stir in the corn mix and optional seasonings (if you choose to use any). Dilute the soda in a tablespoon of warm water. Add the baking soda at the last minute, when you’re ready for the batter to hit the iron. Fold the soda water gently into the sourdough batter. Do not beat it in heavily, you want to encourage the bubble formation, not defeat it. Bubbles will form as the batter lightens (increases in bulk). Bake in a preheated, well-oiled (Belgian*) waffle iron until done. Serve on hot plates accompanied with flavored butter and/or warmed syrup. 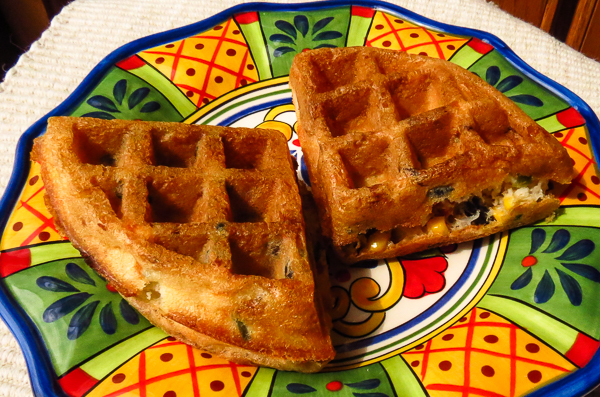 *These will be tasty in any waffle iron, but Belgian waffles have extra deep holes to better hold any toppings.